Eye of Night lesser power (FormID 000aa01d): Improved night vision for 60 seconds, multiple times per day. Khajiit, like Argonians, make good thieves due to their bonuses in skills typically associated with stealth-oriented classes. Eye of Night is a handy lesser power while dungeon-crawling or for seeing at night, when many thieves do their work. Their claw bonus helps in brawls, and, combined with the Fists of Steel perk, makes unarmed combat viable. Khajiit NPCs cannot be married in any way or form, even with the use of the console. The dialogue options won't be there. However, you can use the console to turn a marriageable NPC of another race into a Khajiit. 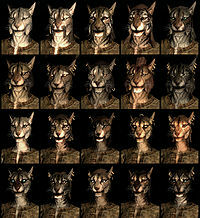 Khajiit characters can also marry NPCs of other races. Esta página foi modificada pela última vez à(s) 20h14min de 3 de março de 2016.